Alan Chamberlain had mentioned that guitar a couple of times already. Something special, he promised. I couldn’t get a clear picture of what he was talking about, but I was quite willing to wait and to see. Yes, sometime – soon perhaps – he would ask me to try out a new kind of guitar some people had been developing. Exciting! My patience was rewarded, because evening time on 7 May, he came round, carrying a bulky guitar-case and a bag or two. This, he said, was the Carolan Guitar and its travel entourage. And, lucky me, it was going to stay with me for a week or so to try it out. 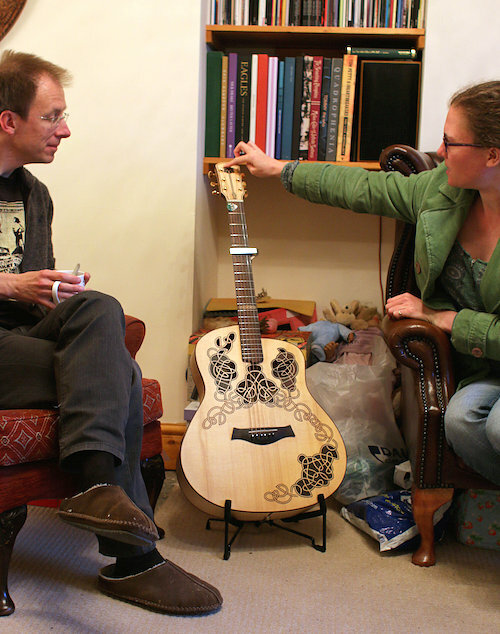 A friend guitar player and singer, Claire, also came along that evening, and the idea was that maybe we could try to do something together – using the Carolan Guitar. At that point I was still a bit mystified about what this guitar was all about. Alan had told me to download an app called ‘Artcodes’ on my tablet, which I had done earlier that day. I had also had a brief look online at the project’s website. But, short of time, I hadn’t gone very deep into all this yet. I had seen pictures of a beautifully decorated, hand-crafted acoustic guitar, and it was quite a thrill to see that very same guitar emerging from the case. Both Claire and I gave it a quick strum to start with, and it was a delight to play already – with its low action and ringing fresh strings. It was light and felt comfortable. Whatever else it might be able to do, I was already quite looking forward to playing this instrument for a week. Alan then explained the concept. Or rather, he lifted a tip off the veil. 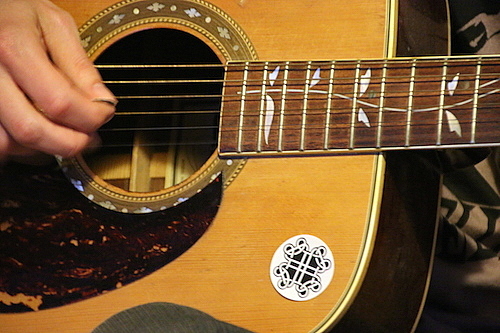 He told us how a number of people had already played this guitar, which was designed to track its own history; how all that information was hidden, linked and retained in the different Celtic-looking patterns all over the body of the instrument; and how the app – Artcodes – enabled you to access all those bits of information online. But he was quite keen not to reveal too much: the idea was that we would discover for ourselves what the guitar was able to do. Basically, we would have a week to find out, play with and even think beyond the capabilities of the Carolan Guitar. An exciting idea! He opened the Carolan travelling case and took out a tripod and camera. With these, he said, we would be able to document our progress. As a musician, my first inclination was to try the guitar purely as an instrument. So in the first couple of days, I played it whenever I found the time. Aware of my chronicler’s duty, I recorded some audio on a small Digital Voice recorder and made simple videos. Here’s one of me playing one of my old Meander songs, in a semi-serious attempt to contribute the first Dutch-language song in the history of the Carolan guitar! To the same historiographical purpose, I also revived my old music-blog, ‘Plug Me Inc.’ (from the days when I was promoting myself anonymously as Ymaginatif and started to document my experience with the Carolan guitar. My first blog post was an introduction to the project, and included yet another sing-into-the-camera home-made video: determined to add something funky to the Carolan canon, I played We All Fall For That, one of those songs I once wrote for The Absence. I had noticed that the Carolan Guitar was semi-acoustic, so always prepared to do something different, I thought I’d record the instrument as an electrical guitar. I set up the amp, effects pedal, and plugged in a cable, but, surprisingly, wasn’t able to get it to work: I either got no sound whatsoever or some heavy crackles. I didn’t see any EQ settings on the guitar, so that idea had to be abandoned. Instead, I recorded the guitar (on my Tascam digital eight-track) through a mic, and layered the signal with some distortion, various effects and filters. I recorded some semi-improvised guitar riffing around the chords Bm7, G and E, as those where the ones Claire and I had vaguely agreed on to use as the basis for the song we would make. 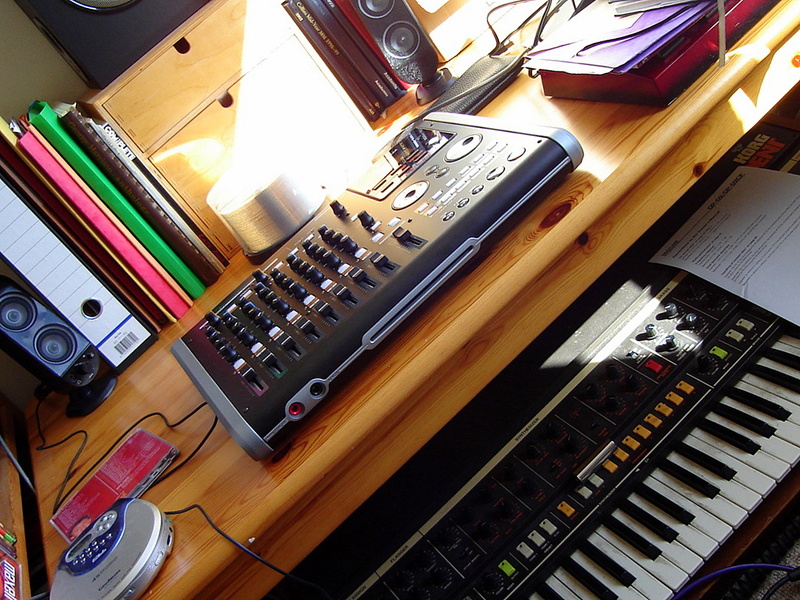 To push the sound even further into the unexpected, I also added some electric drumming and quirky keyboards. 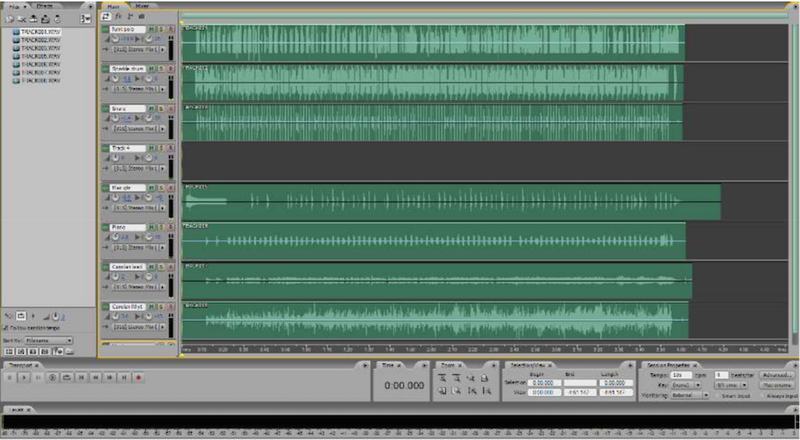 The result, mixed on the computer, was a nervous and weird-sounding instrumental, which initially I thought could be the basis for the song Claire and I were composing. I stuck a title on it – ‘Judith’ (because I had just been listening to a Judith Hill album) – and described (and posted) the results on my blog. Then I began to think a bit further about the ‘other side’ of the Carolan Guitar: its capacity to retain information on its history. What if I could ‘insert’ that song somehow in the guitar? What if one of the patterns on its body led you to a treasure chest of unfinished songs by previous users – which you could pick up, finish, remix etc. anytime you wanted? With that idea in mind, I uploaded the separate multi-tracks of Judith on mediafire, and presented them to my virtual public. I started to give some more thought as to how the interactive aspect of the Carolan Guitar could be used and expanded: what sort of information could be contained in its patterns and handed over from user to user? An exciting idea! Alan even came round one evening and interviewed Claire and me on video, while we tried to come up with clever ideas. He’s got the video, and I wrote another blog entry. In the meantime I had listened to some of Claire’s recordings, and come to the conclusion that Judith was the wrong approach: instead of something quirky, we needed something beautiful – which would suit her voice much better. So, one hour before Claire and Alan were coming round to work on the song, on Tuesday evening 12 May, I started from scratch again. Using those same three chords (Bm7, G and Em), I quickly wrote something much more melodious, folkish and poplike, and, for some reason, using infinitely sad lyrics. I made sure I got a verse and a chorus, recorded a demo to remind myself, and then rushed to do the washing up. Claire wasn’t feeling too great, and we spent most of the evening talking about the possible uses for the aestheticodes. But we did manage to record a very rough version of the new song (Shut This Door), with Claire adding some on the spot harmonies. A quick video was recorded to remember this. The day after that, I invited my musical friend Dylan Jones to do some Carolan Guitar songs. (In the past, we’d done several musical projects together, including The Shoes, The Sheiling and Jones & De Wilde projects. Check them out here. We hadn’t played together for a couple of months, so with the camera running, we recorded some 75 versions of The Beatles’ song Blackbird, turning ‘breakdowns’ into a new art-form – one complete version was posted on the blog. 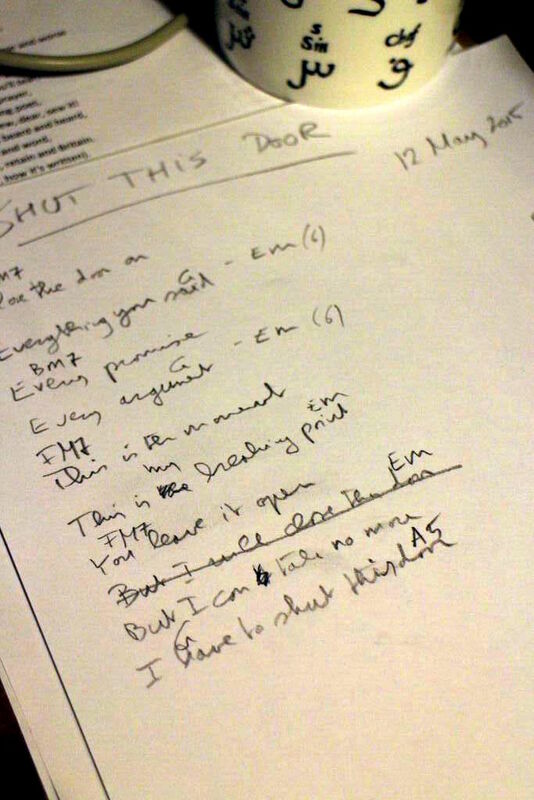 With time being way too short once again, we tinkered just a little bit with Shut This Door – but the song still remained unfinished. The day after that, my time was up: Alan came round to pick up the guitar and hand it over it to the next person – Simon, just down the road. Goodbye Carolan guitar. Since then, working at a slower pace and using my old and trusted Cimar guitar with its ancient and muffled strings, I wrote some more gloomy verses and a downright morbid middle bit for Shut This Door. The song is now really coming together. Last Sunday I recorded a basic track on the portastudio (guitar and guide vocal), and in the near future, hopefully Claire will add her vocals, Alan his manically happy guitar break and anyone who feels like it will be able to contribute further overdubs. We’ll let you know when this Carolan Guitar song is finished.